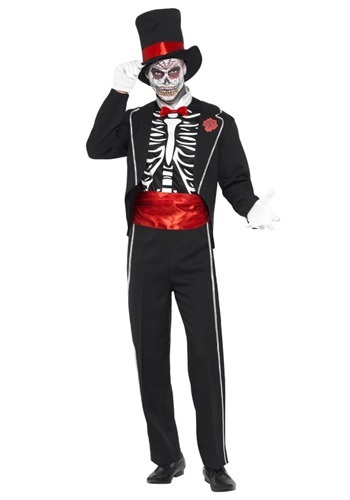 Wear this colorful Adult Day of the Dead Costume with your own black pants and white shirt for an authentic look. The brightly-colored trim on the jacket is festive and fun. All you need to add is a soundtrack of mariachi music. 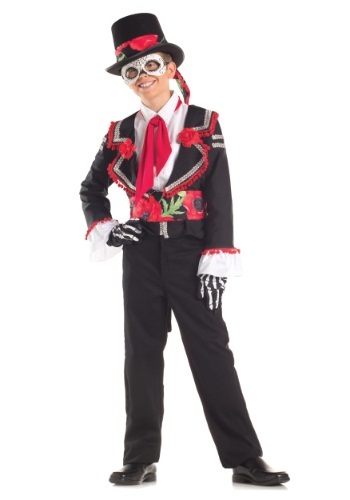 Play mariachi music and celebrate Dia de los Muertos in this Child Day of the Dead Costume! The brightly trimmed tailcoat jacket will turn any ordinary black pants and white shirt into an ethnic costume. The mask is painted to look like a Mexican sugar skull. You'll love this fun costume! 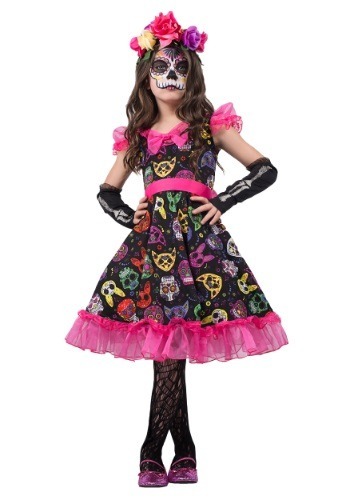 Get ready for Día de muertos with this great senorita costume. Your girl will love the colorful styling in the classic Mexican tradition. She can even wear it the night before the Day of the Dead if she's so inclined! Have you ever thought about how cute a skeleton could be? No? Well, it's Dia de los Muertos and she's about to be the cutest little skeleton on the block! This girls Day of the Dead Señorita Costume combines the skeleton with a Flamenco style that's super cute and super festive. It's enough to have you ready to see skeletons in a new light. Celebrate the Dia de Muertos in style with help of the perfect mask. 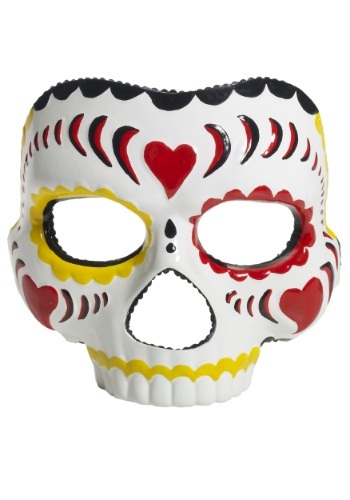 Slip this skull mask on and you'll be set to party all Day of the Dead long! 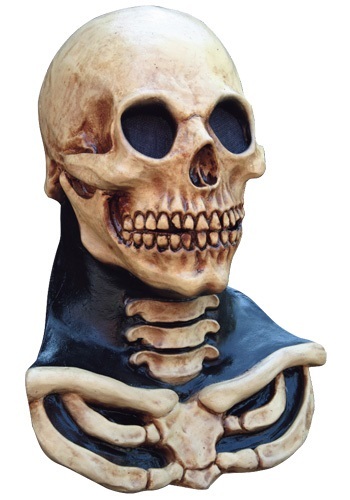 This mask is also a great idea to add some more color to your skeleton mask. Celebrate Dia de los Muertos with this phantasmagorical Day of the Dead Catrina Mask! It’s perfect way to honor the dearly departed. In this Day of the Dead Doll Costume, you'll look just like one of the Calavera Catrina dolls that Mexicans use to decorate graves and altars for their departed loved ones. Wear it to an ethnic festival, or just for fun. NOTE: the petticoat shown in the photo is sold separately. Celebrate the Day of the Dead as a mal sugar skull! 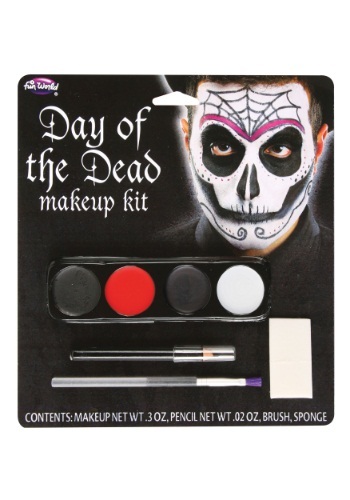 This Day of the Dead Male Makeup Kit is everything you need to transform your face. This spooky Day of the Dead Zombie Mask is truly frightful! It's molded & painted to look like a gray skull with carved designs. Do not drive while wearing it because the eye slits limit vision. It's perfect for extending Halloween another day to celebrate Dia de los Muertos! 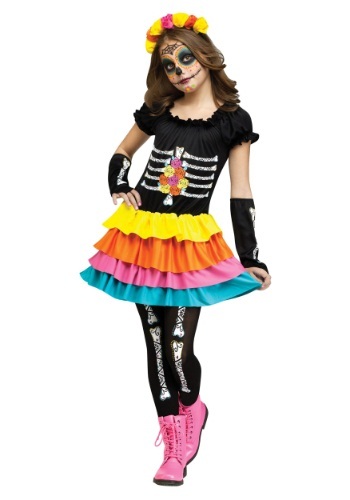 Celebrate hispanic heritage in this Dia De Los Muertos Child Costume! The bright colors add a does of fun to the spirited holiday. Fun as a skeleton costume, too! 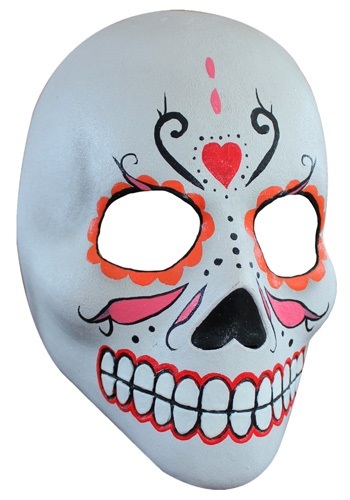 Complete your calavera catrina costume with this Female Day of the Dead Mask for a truly authentic touch! Or turn an ordinary skeleton costume into a Day of the Dead costume. Perfect for any celebration of Hispanic culture! Does your little girl love to dance? 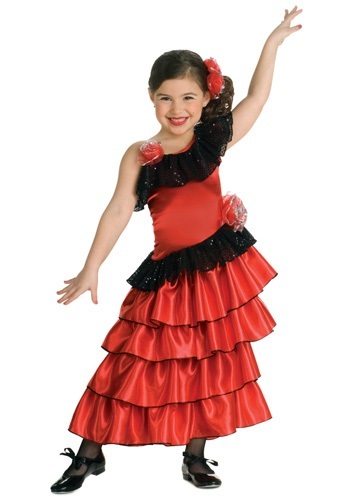 The she'll get a real kick out of wearing this Spanish flamenco dancer costume. All night long your child will be showing off her classy dance moves in this flowing gown. So whether she is looking for a festive Halloween costume or something to wear for a dance recital this costume would be perfect for her. Dia De Los Muertos is a cultural celebration of the deceased and their memory, and while it still has plenty of skulls and skeletons, it's really very colorful! 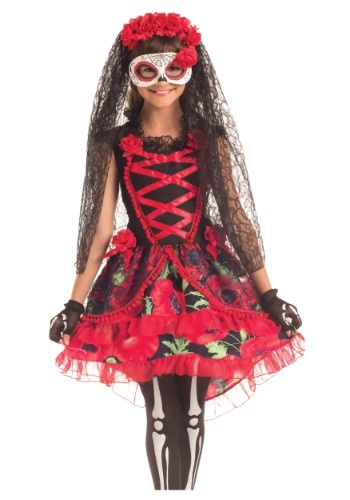 This Girls Sugar Skull Sweetie costume is keeping in the tradition of lots of color and flowers in the hair for girls, and even has bright designs that look playful yet a little spook too. Now all you need to do is give her sugar skull face makeup and then she'll be ready to go to the big Day of the Dead fiesta. The harbinger of death wants your soul. At least that what you’ll tell people when you’re dressed in this Long Neck Skull Mask. It’s a horrific way to frighten children and adults this Halloween. Do you want to know a for sure way to honor the dead? Look your best of course! Suit up in this Men's Day of the Dead Costume. Sugar skulls are used to pay tribute to past loved ones during this Mexican holiday. Have fun celebrating this special occasion. Ole! 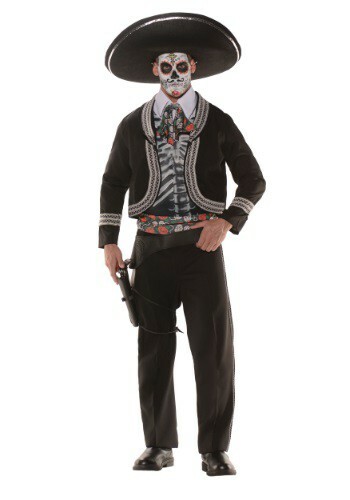 Celebrate the Mexican holiday Dia De Los Muertos when you go in our Mens Plus Size Day of the Dead Costume! It's an eye-catching look that makes you appear like you've come back from the dead for an epic fiesta or just to hear what all your family member have to say about you... good or bad. 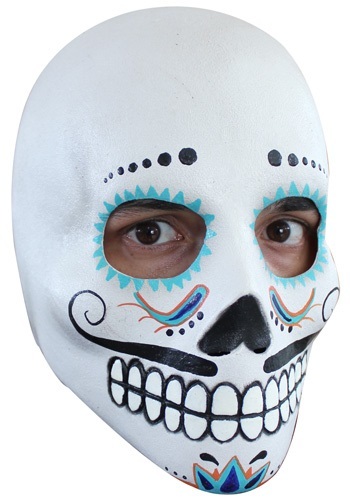 Become the best dressed Calaca at the Day of the Dead festival with this Day of the Dead costume for men. Ole! Beautiful colors, gladiolas, painted faces. Okay. I guess you could technically be at a lot of events, but whenever I place these together, it's Dia de Muertos. 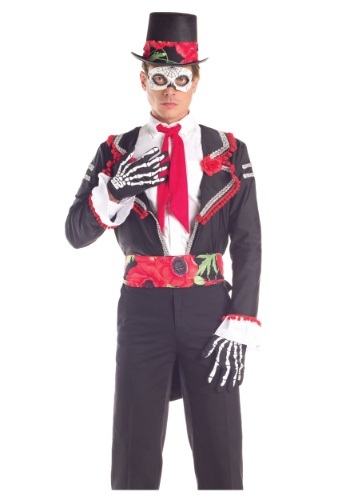 Celebrate in high style with this Mens Day of the Dead Costume. 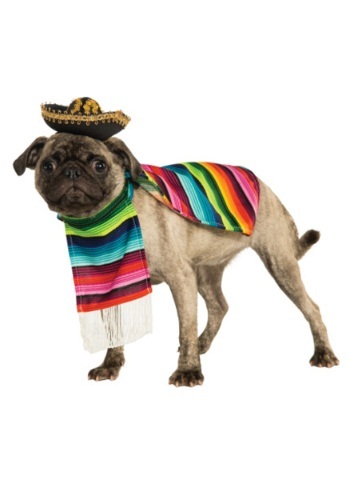 Take your dog south of the border in this brightly colored Mexican Serape Pet Costume. The stripes resemble a woven Mexican blanket, and the sombrero has gold trim. Available in multiple sizes to fit many different dog breeds. If you've always loved the art style of Dia De Los Muertos, then we've got a real treat for you. 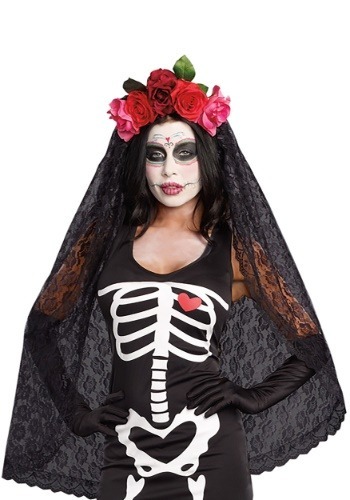 Celebrate the Day of the Dead in style with this womens Queen of the Dead costume! It has fun skeleton and Mexican floral details so you can look spooky and stylish all at the same time. Be sure to get a makeup kit so you can create an amazing sugar skull design and you'll be all set for the huge fiesta this fall. 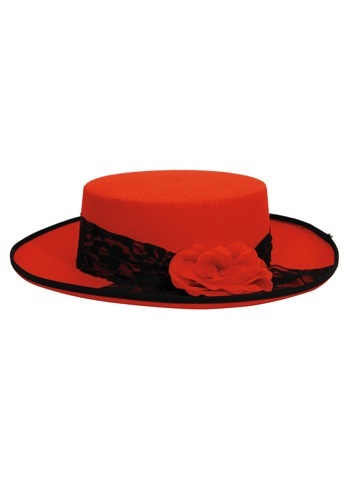 Dress like La Calavera Catrina with this dazzling Womens Red Day of the Dead Hat. It’s the classiest way to transform into the iconic image of the Dia de los Muertos. Pair it with a Day of the Dead costume for a complete look! The white lace, the long veil, and the high collar will turn you into a unique bride. This Womens Nightshade Bride Costume leaves a lot of room for you to be creative. 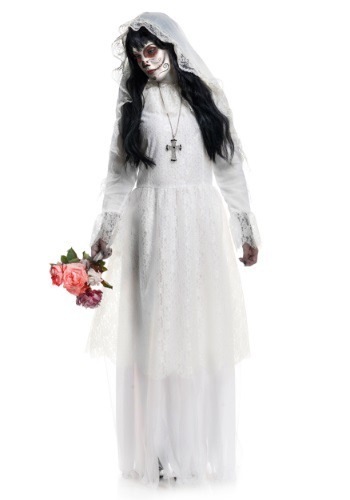 Be a beautiful bride or a creepy bride when you wear this costume. If there is one thing that skeletons love to do it's showing off their legs. Through years of work these members of the undead have sculpted their leg bones to just the right shape that will catch the eye of any ghoul. So if you're looking for spooky yet sassy look then these skeleton tights are just the thing for you. If you don't feel like shakin' what your momma gave you, then giving musical instruments designed for shaking is always an option. Actually it's almost impossible to have these maracas and not shake them. We dare you to try.